Circuit tester for 6V/12V/24V DC systems long probe continuity tester. Used to detect power,ground and find shorts and breaks in wires. Portable-small size,compact structure,equipped with rack,convenient to carry and use. 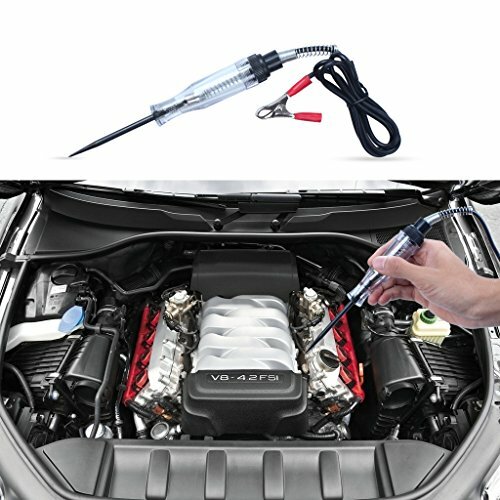 Can be used in automobiles,motorcycles,bulldozers,rollers and other transport machinery maintenance operations. Just unscrew the test pencil top metal cap to replace the light tube and time-saving. If you have any questions about this product by EFORCAR, contact us by completing and submitting the form below. If you are looking for a specif part number, please include it with your message.